To all my friends who put up with me and my embroidery ramblings! Wishing you and your families great joy and many blessings this Christmas and throughout the coming year! December 24, 2010 Merry Christmas! December 25, 2017 Merry Christmas! December 25, 2008 Merry Christmas! I so look forward to your posts-thank you! I hope you have an awesome holiday season. Was beautiful 2nite when your message came thro. Lovely finish to Christmas in the bush, in the centre of NSW, with our 1st grand child. 8mth old Rosalie. Old enough to help take the wrappings off but young enough to enchant us with her innocence. Your 'ramblings' are delightful and inspiring AND you are a treasure. Thank you for your interest and every effort. I'm new to your site (thro a recent Country Bumpkin newsletter)and have loved every posting. They seem to be especially for me, not just the content but the refreshing friendliness too. Thanks, Brenda! I hope you have a terrific holiday season, too! Kath – thank you very much for your kind words! They made me chuckle a bit, picturing Christmas in the bush right now. We are inundated with snow and under blizzard conditions at the moment, so a warm Christmas in the bush is a HUGE contrast! It's wonderful that you got to enjoy Christmas with your first granddaughter – don't kids just make Christmas great?! I'm planning on venturing forth into the elements a bit later today to spend the day with my sister and her family – Christmas wouldn't be the same without them! Mary, may you have a wonderful Christmas day also. I will echo what Kath says, as I found you through that same newsletter. Her words echo what is in my heart as I read your posts every day. As I have said before, I say again, "Thank you!" And to all who read this post, may you have a special day with family and friends also, where ever you are. I live in sunny Southeastern Arizona, and we even had snow a couple of days ago. It did not last long but was beautiful while it lasted. And I think that this is the same storm that dumped snow on you, and much of the country, Mary. Snow in Arizona?! Wow. I didn't pay any attention to this weather front while it was developing, so this whole thing was a bit of a surprise! I just wanted to thank you, Mary, for your lovely embroidery "ramblings" and the time you put into sharing your knowledge with us. I look forward to reading your posts every day and have learned so much! 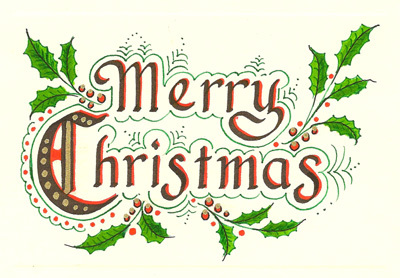 Best wishes to you and yours for a very Blessed Christmas and a Happy and Prosperous New Year! Merry Christmas, Mary! May you have a wonderful day and not too much snow. Thank you for your wishes and I hope that you have a great holiday season with your near and dear ones. I hope you have a lovely day with your sister and her family. Merry Christmas. Your ramblings are so much fun to read, I look forward to them every day. I have so much more information and access to resources that were obtained from your site. In fact, you are quite a resource in yourself. And thank you so much for wishing us "Merry Christmas" instead of "Happy Holidays". May you and your family have a wonderful Christmas together. PS. It's nice here in Southern California, no snow, lots of sun, cool weather. I've been in those blizzards and I'm glad I escaped to California. Thank you for your ramblings, and long may they continue in the new year. And may all your ramblings be bright! God Bless you,your family,loved ones, your creativity and your hands. May the New year hold many rich and wonderful surprises for you. Thanks for your posts on embroidering letters and words using different stitches.